20th Dec – H’s parents were coming over for dinner tonight, admittedly something that doesn’t happen very often as we live a while away. Due to this rare occurrence, they had said to H’s sister that they thought we had something to tell them, which at the time we didn’t! So after dinner we sat them down and told them, H’s mum cried and they were both very excited. 21st Dec – Today was the annual Christmas meal with the girls, but as i pulled up to the carpark, my two best friends arrived at the same time and I couldn’t contain myself so told them there and then in the car park! they screamed and cried and got super excited as this was a first for our friendship group! 23rd Dec – It was H’s sisters 30th birthday party tonight which I had been looking forward to for a while, however now I wouldn’t be drinking! H had work the next day so wasn’t drinking but I was already off for Christmas so was expected to be drinking by the family! I cunningly disguised a few lemonades with a vodka and soda and danced the night away, having to discard the real vodka and soda that H’s brother had got me down the toilet sink! 24th Dec – Every Christmas eve we always go to the pub with my friends and their partners for a few festive drinks, two of my friends already knew however my cousin (who is also like my best friend) didn’t know, so I said I was driving which didn’t arise any suspicions as i’m not much of a drinker as it is. The nausea had started by now so I was feeling rather sick and mentioned this to my cousin as we were in the toilet. Her first reaction was ‘are you sure you’re not pregnant, feeling sick and not drinking!’ and that was it I told her too! 25th Dec – By now the bauble i ordered had arrived so I woke up super excited to hang it on my mum’s Christmas tree for them to discover. Once I got there I hung it on the tree and after my brother and I had opened our stockings I told them there was a present on the tree for them. I filmed the whole thing which was amazing but after much rooting around the tree my mum found it and read it out and couldn’t believe it and started crying. My stepdad and brother were also just as shocked and excited, my brother in particular who has been waiting for to become an uncle forever! H then left for his parents and joined came back later as we headed round to my dads to tell them. Again I put the bauble on the tree and got dad to look for it, everyone was very excited! 26th Dec – On boxing day the whole of H’s huge family descend on his mum and dads so we had to try and tell his brothers and sister’s before everyone arrived. We hung the bauble on the tree (I definitely got my moneys worth!) but it proved a struggle to gather his parents, 2 sisters and brother into the living room. One of H’s sisters spotted a ‘new’ bauble on the tree straight away and was asking questions so we told her to go and have a look but before she even saw it she knew what it said and burst into tears along with his other sister! Again another exciting day and brilliant end to Christmas. Although these posts were written later on in the pregnancy, i have scheduled them to be the correct timings. I found out i was pregnant at 3 weeks and 6 days on Friday 19th December 2014. Having been taking pregnancy tests for the past few months, I knew the drill. However this week I had been feeling so tired, i even had to leave a meal out with the family early (i’m not one to miss out on good food!). I also had broken out in huge spots on my chin which i again, never have so things did feel different this time but i wasn’t getting my hopes up. It was before work and I left the test on the side and got on with getting ready. When I came back there was the faintest line but it was definitely there! I think i screamed to myself, then laughed and then cried a little – but i was late so rushed out the door to work. 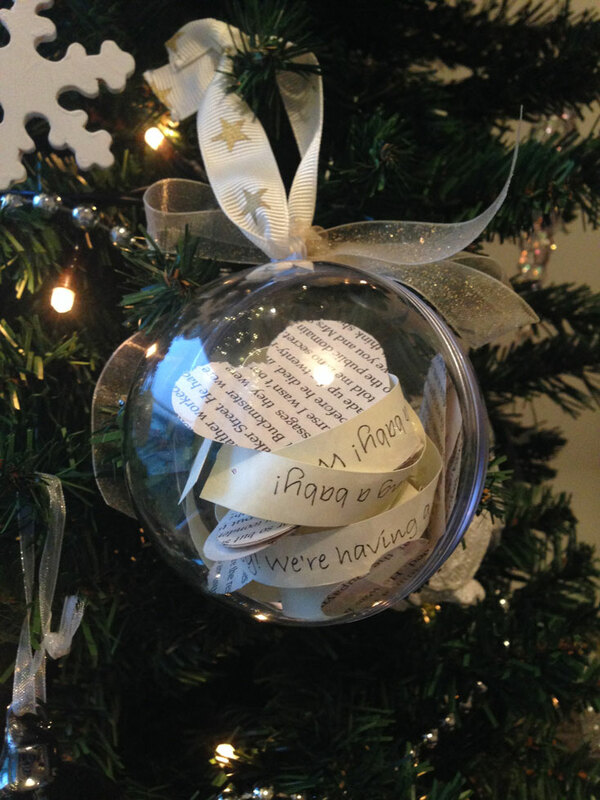 Once at work i began thinking about how to tell H and with it being near Christmas i wanted to make it special so bought a bauble which had ribbons of paper inside that you could write a message on, so i simply wrote ‘We’re having a baby!’ and ordered it for next day delivery. Later that evening I checked if that included Saturday delivery which unfortunately it did not. Sitting on the sofa with H I knew i couldn’t wait until Monday so ran off to write his Christmas card…. ‘We’ve got our Christmas miracle… we’re having a baby!’.